I am taking part in this months Bake Together held each month by Abby Dodge, where we are invited to use a recipe from Abby and make our own changes to that recipe. The theme for the February bake together is Cheesecake! I’m supposed to be on a diet, supposed to be watching the carbs so cheesecake making I should not be taking part in! But its cheesecake which happens to be one of my husbands favorite desserts and it’s almost Valentines day so it’s a great excuse to make an edible mens valentines bouquets, won’t that be something nice! Reading this back I can see how I’m justifying making the cheesecake! To hell with it! I just want some cheesecake! I’ve seen a few great versions of others joining in the Bake together and dreamt up a few of my own versions, so here it is my variation of Abby’s recipe. Really, I thought Abby’s recipe sounded and looked just perfect so I found I really wanted to make 2 cheesecakes, one of the original recipe and one of my version but there I did resist! I will be making Abby’s another time! For my version the first thing I changed was the size, as it was only my husband and I eating the cheesecake (and I’ve got that boring diet nag in the back of my head!) I halved the recipe. I have a cute little 5 inch loose bottom cake tin so I used that. The next change was the easiest as I don’t have any Graham crackers so for the base I used Lotus biscuits, also known as Speculoos. This was going to be a chocolate cheesecake , with Valentine’s in mind but then I saw some lovely big strawberries in the supermarket so I got those to use instead. I should have known better, no matter how lovely strawberries look, out of season they are always a disappointment! Not wanting to make another shopping trip I sprinkled some sugar onto the strawberries and roasted them to bring out their flavour. I then pureed the strawberries to swirl through the vanilla mix once in the baking tin. I was a little heavy-handed with my swirling of the puree so the cheesecake was a little more pink than I intended but that does not affect the taste, which I was very happy with! I did have alittle too much for a 5 inch pan so Ithink this would work better with a 6 inch if you have one. Place the prepared strawberries in a baking tray, sprinkle with sugar and bake for around 1 and a half hours, until the strawberries have shrunk a little and given out their juices. Place in a blender and puree, you may need to add a few drops of water to get things moving if the strawberries are not that juicy. Reserve the puree for later. I followed Abby’s instructions See here until just before putting in the oven. 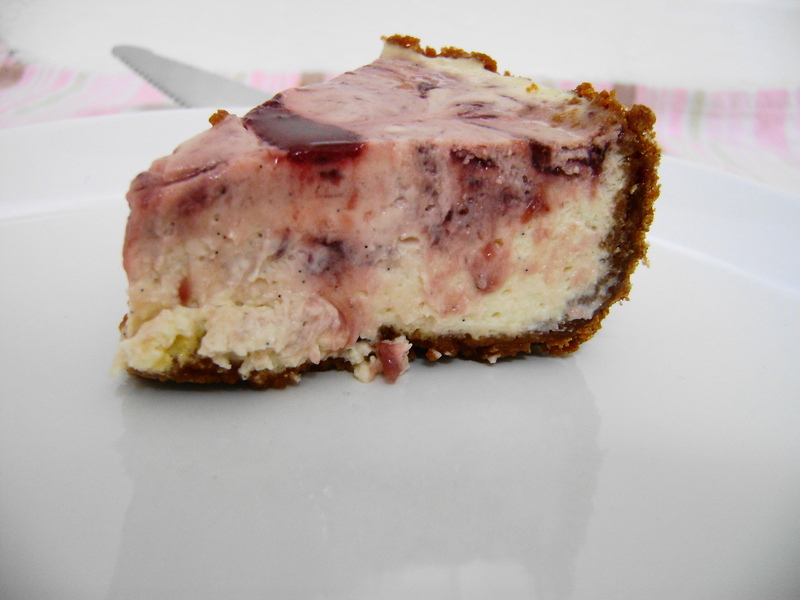 Then I dropped a few teaspoons of strawberry puree on the top of the cheesecake already in its tin. With a skewer I swirled the puree into the cheesecake. The idea is to make gentle swirls but I was a little heavy-handed and over mixed so did not get the swirls I was after. A light swirling motion is all that is needed. This entry was posted on February 13, 2012, 10:21 and is filed under Baking. You can follow any responses to this entry through RSS 2.0. You can leave a response, or trackback from your own site. 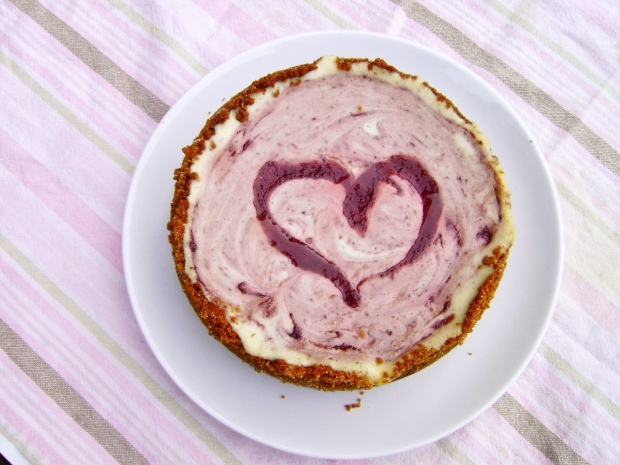 What a lovely cheesecake and such a simple idea for something romantic too! The cooked strawberries look and sounds delicious. I love this! Thanks Abby, I loved your recipe! Nice! Maybe I should join this baking challenge – is it open to anyone? Yes! It’s open to all! Gorgeous Jayne! I will give this a go and then file it away for the summer, when the strawberries are really, really good! I just love cheesecake. This looks so elegant and happy. I am not a great baker, but you make me think I can do it. Brava. Thank you! Of course you can do it! Baking challenge? I am game! This looks divine! I love your recipes. And so I’m presenting you with the Versatile Blogger Award. For more info, see my blog!